HandyPNP – the Plug & Play portable! 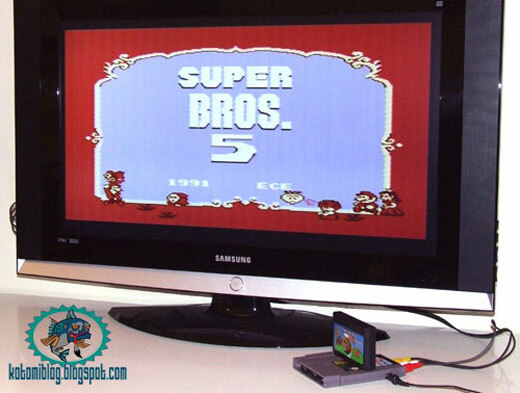 a multi mini console that would play all sorts of plug and play systems! Greetings everyone! I’m on the prowl for Emulation frontends for the idea of reviewing them for the masses. What is your favorite Front end? (Please provide a link.. where as I’m great with Google it’s just easier. 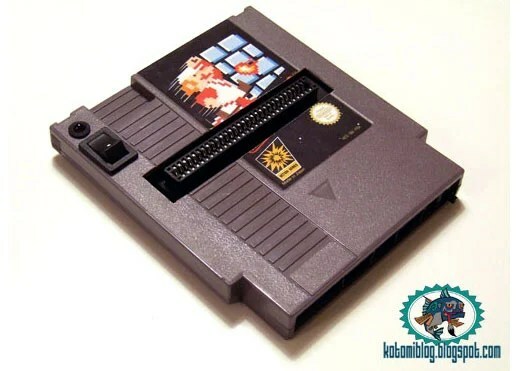 NES in a NES cart!? 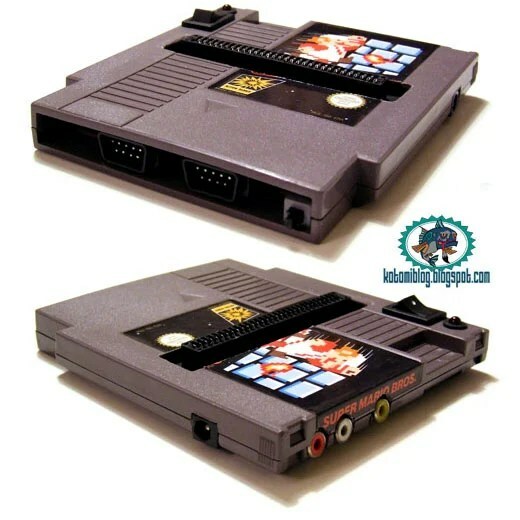 Ok.. JUST cool… Someone crammed a fully-loaded NES into the body of one it’s own carts..
There’s something just a little mind-bending about a game cartridge that isn’t a cartridge at all, and instead is a console itself. If you think about the concept too hard, it might just cause a rift in the space-time continuum. A look at the process of converting a professional drum kit for use as a Rock Band game controller. For those that have been living under a rock for the last couple of years Rock Band is a video game that allows you use controllers that are shaped like musical instruments. Using technology from their previous titles like Guitar Hero and Karaoke Revolution, Harmonix stepped it up and combined all of them into one title called Rock Band. The biggest new addition was the drum pads. For the regular consumer these are okay but for the nutty power drummer who plays like Bam Bam on a sugar rush they can’t really stand up to the abuse. And besides, when we open the doors to Otronicon V.3 and make this available for anyone to play I want to make sure that it could stand up to the abuse. So, to create the look and feel of a real stage performance I wanted to modify these drums a bit. Mickey Greer and Tim Brown of Guitar Center of Winter Park here in Florida are good friends of the Orlando Science Center and gave me a sweet deal on a full sized drum kit that I couldn’t pass up. Like a few people that have modded full sized guitars I did the same with one of my PS2 controllers using an Ibanez guitar. But, since others beat me to the punch I didn’t bother with a build report for it. However, I haven’t seen anyone mod the drum pads yet so here goes a full build report. The first thing that I had to do was start assembling the Gibraltar drum rack. I wanted to use a rack specifically because it keeps all of the drums hard mounted to each other which is important since there will be wires linking them all together. It will also make it easier to transport the kit to the stage when Otronicon begins. Now that the rack is assembled I can get to the business of figuring out how the drum pads work. I started by removing the red pad which is held in place using shaped rubber inserts. The rebound and shock absorption of each pad is just four pieces of foam cut into pie shaped pieces. The pads that come with the game are on the right and the high tom drum is on the bench to the left. After opening up one of the pads I found that it uses a simple piezoelectric cell to detect vibration. Pretty ingenious and elegantly simple. Now that I understand how that works it is time to move on to completing all hardware components before dealing with the electronics. One of the common points of failure with the Rock Band kit is the kick drum pedal. The plastic foot pedal has a problem with breaking from people stomping on like like they were riverdancing. So, to alleviate that I used the steel foot pedal that came with the drum kit. The kick drum switch on the game is triggered using a magnetic reed switch in the base of the pedal that is activated by a small NeFeB magnet on the foot controller. I made a s-shaped bracket and mounted a heavy duty SPST NO Momentary switch to replace the magnetic reed one in the foot pedal since all of this metal would interfere with the magnet anyway. The kick drum clamp acts as a mechanical stop for the pedal to keep it from crushing the button. Also, the game pedal using a compression spring with a constant K value (meaning pressure increases that further you press down) whereas the professional drum kit pedal uses a chain and cam to provide progressive resistance and then release to snap at the bottom of the stroke. This makes the kick drum notes feel much more natural. The next challenge was to mount the LCD monitor for the drummer. Since each of the guitarist and the lead vocal have their own screen I wanted the drummer to have the same convenience. The monitor is a 21″ Dell with a composite input just like the others. However, I needed to find a way to mount it in the rack. The kick drum had a mounting point for the high tom which was no longer being used. So, I went into the shop and found a piece of aluminum bar that would fit the mount. next, I had to machine an insert that would fit into the bar so that I could drill and tap it with a 1/2-13 thread. I wanted to use a big bolt because this is the ONLY thing attaching the monitor to the rest of the drums. Unfortunately, the bolt that I had was too long and the head was too tall and it had a shoulder that had to be turned down. Fifteen minutes on the lathe and I had a bolt that was short enough, had a low profile, and would screw in flush to work to mount the monitor. Viola! We have a monitor mounted in the rack. You will notice that the screen seems to be highly reflective. That is because I put a sheet of 1/4″ Lexan polycarbonate over the screen to protect it from errant flailing drumsticks. You can smack the dead center of the screen with the sticks and it doesn’t even phase it. Next you will notice that the heads of the drums are now black versus the usual white or clear ones. That is because I replaced them with Kydex. This stuff is so strong that I played one song on the drums using two crescent wrenches and didn’t even leave a scratch on them. Now that the hardware stuff is done it is time to move onto the electronics. After removing the pads you can see the piezoelectric cell in the center of the pad. It is held in place with a spring and a retainer to make sure that the cell is pressed flat against the pad. The next few pictures came out a little blurry but they are basically the cell removed from it’s cradle (showing both sides). The second group of pictures is of a piece of foam being placed over the cell on the back of the Kydex to act like the spring in the original mount. You will noticed also that I had to splice longer lengths of wire to make sure that they would reach the control panel when it is finished. Yep, after plugging it into the open spot where the red pad used to be it seems to work very well. So well in fact that just tapping on the side of the drum is enough vibration to trigger it. So, the next few hours was spent putting the cells in the other three drums. After finishing the install I tried all drums and they worked very well. The only drawback was that the drums still sounded like drums even with the Kydex heads on them. In an effort to help quiet the drums I fill each one with foam. It did work to an extent. There is still a rather loud tapping sound from striking the plastic heads but it isn’t quite a pronounced as before. Another side effect is that the piezoelectric cells aren’t as sensitive since all vibrations are damped almost immediately. Once I have the stage set up I am planning to remove the foam to improve sensitivity. Now comes the fun part; dealing with all of the interconnects from the pads to the controller. After removing all of the electronics I take the plastic shell over to the band saw and cut out just the control box. This is the first thing that I have done to the pads that is irreversible. The picture to the left shows the control box mounted under the monitor but I haven’t wrapped the wires in split loom yet. the picture to the right has all of the wires covered in split loom to match the color of the drum kit. The odd silver wire is a shielded two-conductor wire that leads to the kick drum pedal. Overall I am very pleased with the outcome and I think that it will withstand a lot of abuse. This drum kit will be available for public play at the next Otronicon, January 18-21, 2008 at Orlando Science Center in Orlando, Florida. We will also be holding Rock Band and Guitar Hero competitions and the first place winners will get to perform live at Hard Rock Live in Orlando as the opening act for Video Games Live! I will post pictures of the completed stage within a week as well as posting videos of the drums and the rest of the Rock Band stage in action so be sure to check back here! Also, check out the rest of otronicon.org to see all that’s going on at this year’s Otronicon V.3! An upcoming firmware update for Memor32 – the PS2 modchip on a memory card – promises to allow your non-chipped PS2 to play your entire collection of games from the comforts of a roomy, capacious USB hard drive. A group of Russian hackers named Memento are responsible for the firmware handiwork, allowing hard drive-based playback of your entire collection of PS2 discs for easy access, TiVo-style. Sure, the unscrupulous amongst you may use your Memor32’s new found powers for evil, but we just want to fire up Shadow of the Colossus without leaving the couch. A hack of Wii Guitar Hero Guitar so it can actually be played like an instrument, with up to 45 different pitches. Finishes up (with one or two minor mistakes) the verse, chorus and solo to “Smells Like Teen Spirit”, by Nirvana, to demonstrate this. This program unpacks Playstation 3 Theme files (.p3t). By default, it will extract the contents of the theme file to the directory ‘extracted’ in the current directory. IMPORTANT: You need to have the binary ‘p3tcompiler.exe’ in the same directory as this program, even when it is being run from Linux. This requirement will probably be removed soon. This program is still in alpha stage and probably has dozens of bugs. If you find any, please let me know! Copy p3tcompiler.exe from PS3_Custom_Theme_v101-E.zip into the \p3textractor folder, which you may have already if you create your own themes. Start a DOS window. Start – Run – CMD. Now you can use the icons or backgrounds in Pixels.p3t for any theme that you create. Here’s a quick tutorial on creating ps3 themes using the images you just extracted.